The Global Volcanism Program has no activity reports for Sierra Nevada. The Global Volcanism Program has no Weekly Reports available for Sierra Nevada. The Global Volcanism Program has no Bulletin Reports available for Sierra Nevada. The Sierra Nevada volcanic complex, located in one of the most inaccessible parts of the Central Andes, covers an area of about 225 km2 astride the Chile-Argentina border. The complex is of partial Holocene age and includes at least 12 volcanic vents with associated lava flows (de Silva and Francis, 1991). Craters up to 400 m in diameter and large andesitic lava flows that extend up to 7 km with well-developed flow ridges are present. The oldest part of the complex, at its eastern end in Argentina, includes two stratovolcanoes, one with a 1-km-wide summit crater. Pichler H, Zeil W, 1971. The Cenozoic rhyolite-andesite association of the Chilean Andes. Bull Volcanol, 35: 424-452. The Global Volcanism Program is not aware of any Holocene eruptions from Sierra Nevada. If this volcano has had large eruptions (VEI >= 4) prior to 10,000 years ago, information might be found on the Sierra Nevada page in the LaMEVE (Large Magnitude Explosive Volcanic Eruptions) database, a part of the Volcano Global Risk Identification and Analysis Project (VOGRIPA). There is no Deformation History data available for Sierra Nevada. There is no Emissions History data available for Sierra Nevada. 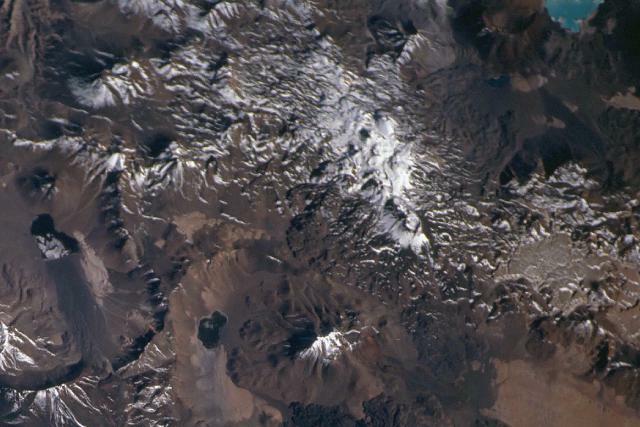 The large snow-covered massif near the center of this NASA Space Shuttle image (with north to the upper left) is the Sierra Nevada volcanic complex. The complex covers an area of about 225 sq km astride the Chile-Argentina border and includes at least a dozen volcanic vents with associated lava flows. Two large Pleistocene calderas lie south of Sierra Nevada, the 22-km-wide Wheelright caldera (part of which is visible at the lower left) and Escondida at the bottom center, with a lake on its caldera floor. NASA Space Shuttle image STS100-710-48, 2001 (http://eol.jsc.nasa.gov/). There are no samples for Sierra Nevada in the Smithsonian's NMNH Department of Mineral Sciences Rock and Ore collection. Large Eruptions of Sierra Nevada Information about large Quaternary eruptions (VEI >= 4) is cataloged in the Large Magnitude Explosive Volcanic Eruptions (LaMEVE) database of the Volcano Global Risk Identification and Analysis Project (VOGRIPA).